Buyers – MedNeeds, Inc. will attempt to sell you the highest quality equipment to meet your budgetary needs. Cashiers checks and money orders will be accepted at this time. Sellers – MedNeeds, Inc. will either broker your equipment for you , or buy it from you. Give us your best possible selling price for a quicker turn around time. 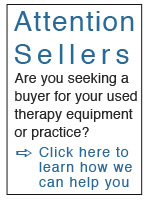 MedNeeds is interested in purchasing all types of therapy equipment. What follows is a list of items we currently have a need for – if you have any therapy equipment for sale, let us know. Please fill out the form, and we’ll be in touch with you soon. Please fill out the following form, and we will contact you shortly.